In this video, Daryle C. Tibbs gives a review of the book, Crazy Time by Abigail Trafford. I highly recommend this book to people in the early stages of learning about the divorce that is barreling down the highway towards them. 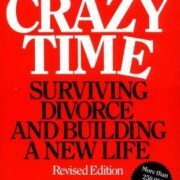 Crazy time, as the title suggests, acknowledges the craziness that can be divorce. This book focuses on the different stages of the process and the different ways for dealing with those stages. All of this is written through the lens of the author that describes the final days of, what she now acknowledges as the end of her marriage. This book is especially important for someone that has had very little experience with divorce, which we may believe can be very few people anymore that have not experienced divorce; however, people have a tendency and an ability to refuse to believe that this could ever happen to them. This is for those people. If they have blinders on when speaking to friends about their divorce, they probably have blinders on in their own marriage. The best part about this book is that before wrapping up, it acknowledges the good that comes out of marriages ending. This is important to me because this is one of the things I enjoy about my job. I get to see the transition from scared and weak to strong and ready for the change. This book presents the greener pastures beautifully. I would give this book five stars.